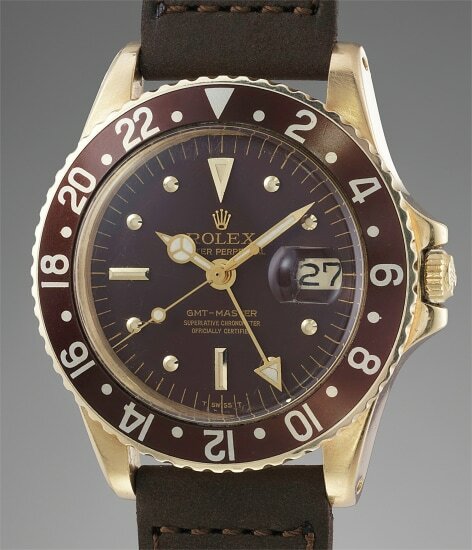 It is well known that the Rolex GMT-Master was born after a joint effort of Pan American Airlines and Rolex to create a pilot’s wristwatch. Reference 6542 was the first iteration of the product line and was originally made for pilots to keep track of “home” and “local” times. The reference 1675 was its successor, building on the model’s tool watch lineage, and was offered in stainless steel, stainless steel and gold, and all gold models. The professional vocation of the watch means that gold models are comparatively much more scarce and difficult to come by, especially in such attractive condition as the present piece: these were watches which were usually worn extensively by their original owner. The rich tones of the gold and brown bezel and dial, boosted by decades of aging, provide the wearer a glimpse into the golden era of travel. A handsome example, this GMT-Master ticks all the boxes for both the casual and serious collector with its distinguished gold case, beautiful dial, and excellent condition. It will bring years of pleasure to its next owner.